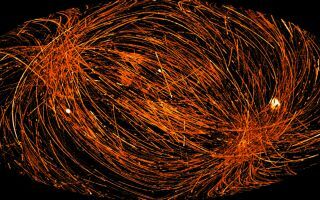 This fascinating space wallpaper records more than a thousand movements made by ESA’s XMM-Newton space telescope as it shifts its gaze from one X-ray object to another. This fascinating space wallpaper records more than a thousand movements made by ESA’s XMM-Newton space telescope as it shifts its gaze from one X-ray object to another. Orbiting in space since 1999, XMM-Newton is studying high-energy phenomena in the Universe, such as black holes, neutron stars, pulsars and stellar winds. Even when moving from object to object, the space telescope collects data. These slews are represented by the bright strips of X-ray data in this image, which records more than 1200 individual slews between 2001 and 2012, and covers about 62 percent of the sky. Well-known X-ray sources are seen in the image, including the Vela supernova remnant (the bright white feature at the far right), the Cygnus Loop (far left), and Scorpius X-1 (just above the image center). This image was released July 29, 2013.